WHAT have the snows of Kilimanjaro, the Florida Everglades, white rhinos, giant pandas, Venice and a small back street in Kentish Town got in common? Answer: They have been named in a new guidebook of important things to see before they are destroyed or become extinct. 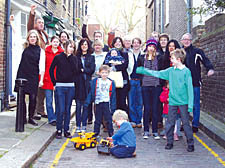 Little Green Street, a cobbled Georgian dead-end street off Highgate Road, has made it into a new book titled 500 Places To Visit Before They Disappear, edited by New York-based author and eco-expert Holly Hughes. Residents have warned the narrow mews is threatened by developers who want to use the road to allow lorries access to wasteland where 30 homes and an underground car park are planned on the site of a former railway workers’ club. Little Green Street’s inclusion in the book, published this week, is timely. Today (Thursday) is the deadline for the developers, Euro-Investments, to register their appeal against the council’s decision in February to kick out their proposals. They hope a ruling by Camden Council banning lorries from the street will be overturned. Little Green Street isn’t in the centre of London, but maybe that’s why it survived so long – it’s one of only a few intact Georgian streets left in the whole metropolis. These two-story brick houses may have survived the Blitz in World War II, but the inexorable march of gentrification is another thing altogether. What’s especially ironic is that the houses of Little Green Street aren’t themselves being knocked down. They are listed as Grade II historic properties. No, it’s the street itself that lies in danger. The street comes honestly by its name: Little Green Street is only 2.5 meters (8 feet) wide... Little Green Street looks like a perfect slice of Regency London; it’s been cele­brated in the poetry of that quintes­sentially British poet John Betjeman.